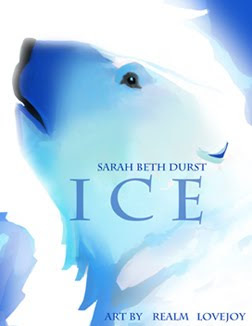 Brr--it's been getting chilly fast as winter approaches...but the good news is, it's the perfect time to read ICE by Sarah Beth Durst (published by Simon and Schuster)! ICE just recently came out a couple months ago and Sarah is here today to tell us more about her fantasy novel with the stellar cover art! I was thrilled when she requested me to draw Bear! It's not often I get to draw an animal! I had a lot of fun trying to color the bear in arctic blues. 1) Thank you for joining us, Sarah! What is ICE about? ICE is set in the present-day Arctic and is about a polar bear, true love, and one girl's impossible quest across the frozen North. 2) Can you give us the story on what inspired you to write ICE? I wrote ICE as a love letter to my husband. It's about the kind of love where you face the world as a team... the kind where you'd go beyond the end of the world for your love. It's inspired by the Norwegian folktale "East of the Sun, West of the Moon," which is a variant of "Beauty and the Beast" where the Beauty embarks on a quest to save the Beast. I chose this tale because I was tired of all the fairy tales where the girl spends the whole story asleep or, y'know, dead. I veered rather far from the original tale in my book, but at its heart it is still about a fearless girl and a boundless love. 3) The cover of ICE is gorgeous! Can you tell us about the artist and what you think about the cover? 4) What was your journey to publication like? I had a very standard journey to publication: write, submit, wait, repeat. In other words, I wrote a manuscript and then sent queries to agents whom I thought might be interested in representing me based on research I'd done. The trick is, though, that this process can take a while -- you need to get the right manuscript in front of the right person at the right time, and there are a LOT of people out there trying to do the same exact thing. So you need to stick with it. After you send out a query, don't wait around to hear back. Write another manuscript and then another and another. 5) Can you share with us your writing process and advice? Everyone's writing process is different. It depends on how your brain works. You need to find what works best for you and ignore advice that doesn't fit. So with that disclaimer... I write every day, and I highly recommend it. If you write every day, then writing becomes a habit, rather than an enormous undertaking. Don't wait for inspiration. Don't wait for large stretches of time. If you want to be a writer, then make writing part of your life right now. Great advice! Thank you, Sarah! I'm excited to read ICE--it sounds like a beautiful story. If you'd like to purchase ICE, you may do so here. Cheers! 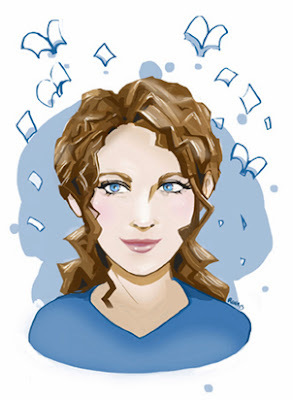 If you're an author, editor, agent, or illustrator and would like a five question interview and a drawing of your character (or of yourself), email me at rtlovejoy (at) yahoo (dot) com. Check out the FAQ page for more information! This book sounds amazing! I just heard about it this week. Can't wait to check it out. Great art work, Realm! Hurray! Another book where the heroine is not an enfeebled nincompoop! Can't wait to read it! Thanks for visiting, ladies! I def need to get ICE to read over the holidays. I SOOO LOVED this book, its like my favorite of ALL time. I so want their to be a film of this.